Sam Bompas and Harry Parr (pictured left), have re-imagined the concept of jelly. Yes jelly--the gooey transparent food substance that used to amaze us as children. And yet now they appear dubious at our second adult glance: having to think of what it's really made of, and how it comes in countless unnatural colors. Bompas and Parr however, have figured out how to market this gooey dubious substance to a branding new level--far beyond the mere packaged j-e-l-l-o, but smeared with decadence, opulence, and enigma--promising not just a taste to remember, but a "food experience" to tell your kids about some day. As one half of the jello mongers, Bompas describes their fruitful escapades as more like "epic undertakings." 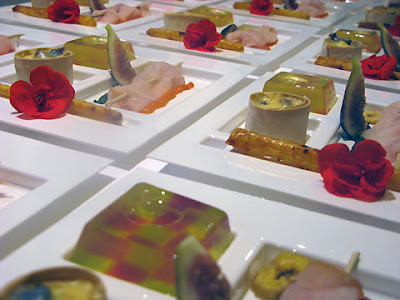 Parr also admits, "We want people to experience something very special, and for us food is a very interesting medium. And they've made food as a medium very interesting indeed: The London based business chums have ascended into the spotlight since 2007, as they've certainly created much more than a jello buzz, they've created a fantastical escape--holding their festivities in castle like venues--as well as adding alcohol creatively into the mix. For instance, they host an event the blokes refer to as, "Alcoholic Architecture." At such extravagant events, alcohol in the form of gin and tonic are served as clouds for their guests to inhale; or creating a river spiked with whisky to canoe through--while scooping up a drink, to go with their unforgettable jello centerpieces. According to Bompas, prior to launching these types of operations means going into great lengths to make sure that such measures are safe with doctors, scientists, and mixologists alike. The creative process from inception to execution begins as a sketch on CAD modeling (a digital rendition of their jello presentations), followed by cooking their designs into edible gelatin (which is just a percentage of the equation in creating the experience of their brand); and then finally, coming up with the critical larger-than-life-production to showcase their precious garish treats. "People call us food designers, culinary wizards, and architectural food smiths--which could mean everything or it may not mean anything at all," says Bompas--an acknowledgement that perhaps the Bompas & Parr brand is simply as intangible as the gooey colorful substance that used to amaze us as children. 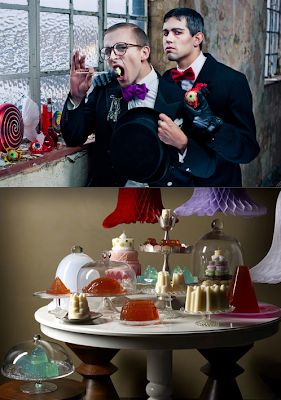 To learn more about Bompas and Parr--aka the Jelly Mongers, have a watch at their recent interview (above via Gestalten), and a look at our slideshow (above as well).